Boxer Lee McAllister, the Aberdeen Assassin, made boxing history on the 28th July 2018 at the Beach Ballroom when his opponent Danny Williams, the Brixton Bomber who once knocked out Mike Tyson, threw in the towel at the tenth round. Lee, who began his sporting career as a lightweight, fought eight divisions higher and won the World Boxing Union heavyweight title. This WBU bout saw his opponent weigh in as four stones heavier. 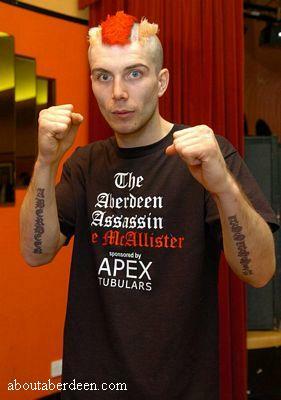 Scottish boxer Lee McAllister was born in Aberdeen on the 5th October 1982. His nickname is the Aberdeen Assassin. He proudly wears the red and white colours on his shorts, dyes his hair bright red and has a tattoo on his left chest of a hooded assassin. On Friday 19 October 2012 he was to have defended his Commonwealth light-welterweight title at the Beach Ballroom against British Masters Champion Eddie Doyle of Glenboig. Sadly he developed an injury so it is postponed. 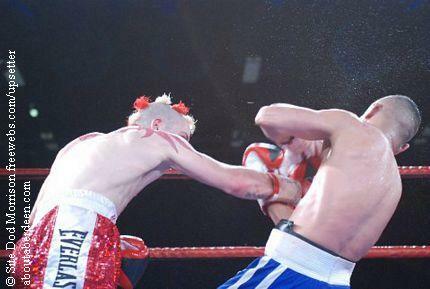 He fought Denis Shafikov from Russia at the Aberdeen Exhibition and Conference Centre on 25 February 2012. This Euro Light-Welterweight bout was screened live on Sky TV. He retired on the 7th round due to a left elbow injury. 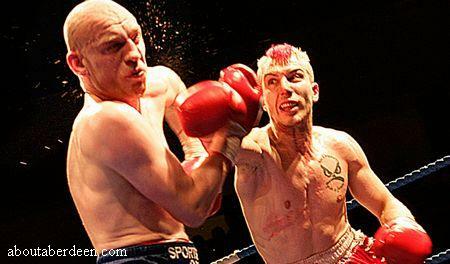 He boxed Karoly Lakatos from Hungary at the Beach Ballroom on Friday 23 September 2011. He won in the third round. Isaac Quartey from Ghana boxed hime on 11 June 2011 at the Beach Ballroom. He won to win the Commonwealth Light-Welterweight Belt and became the first man in Scotland to hold two Commonwealth belts at the same time. The Istvan Nagy match took place on 26 February 2011, over a year since he had an operation to his elbow which delayed his career as a boxer. 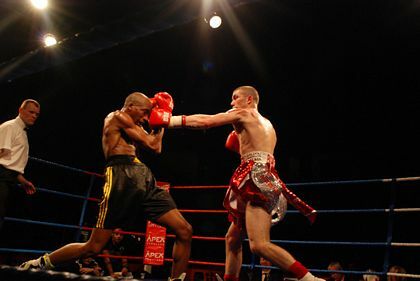 Istvan Nagy from Hungary was knocked out in the sixth round. This earned his seventh belt which was the IBO International Light Welter Weight. McAllister and Samuel Amoako from Ghana boxed on Friday 29 January 2010. This was the first time that he was to be televised and appeared on Sky Sports channel live from the Bellahouston Leisure Centre in Glasgow Scotland. The weigh in took place on Thursday 28 January 2010. He weighed 9st 8lbs 4oz and on the night sported his trademark red haircut and red shorts and won. Mall Trinity Centre where staff were encouraging people to become foster parents. 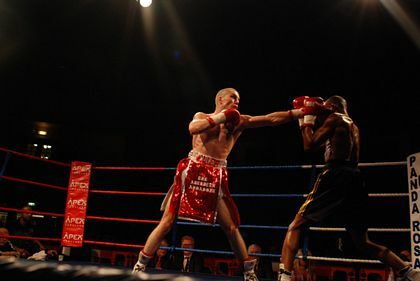 Charlie King from Motherwell, Scotland fought on 17 October 2009 where Lee gained in the seventh round giving him a record of 30 wins from 32 bouts. It is thought that his next match will be with the European Lightweight Champion Anthony Mezaache on Friday 18 December in Glasgow, Scotland.  It is currently being organised by his promoter Tommy Gilmour and may be screened on television. On Friday 19 June 2009 he won the Commonwealth Lightweight Champion belt when he knocked out Godfred Sowah from Ghana in the third round. 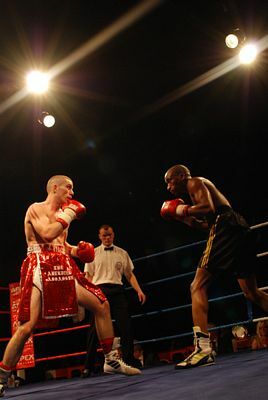 His next fight was held at the Beach Ballroom on 14 March 2009 with Abdoulaye Soukouna from France. He won 79 to 73. 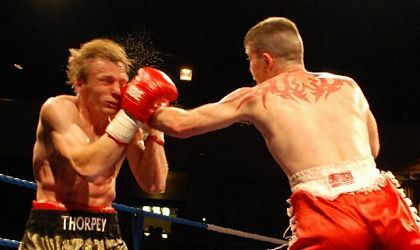 In the summer of 2008 he gave up his two belts (WBU world lightweight and light-welterweight) so that the British Board of Boxing Control could name him as the number one challenger for John Murray and his British lightweight title. It is thought that he could fight him this year with it broadcast on Sky Sports. This will take place on 17 January 2009. This was postponed from the 29 November 2008 and the 13 December 08 because John Murray had to recover from a cut eye. 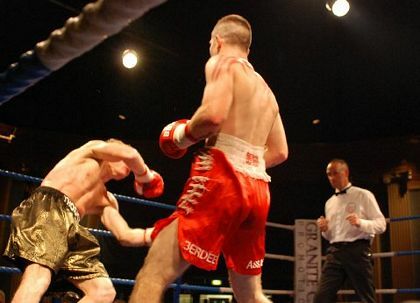 The John Murray bout took place on 17 January 2009 at Robin Park Arena in Wigan, England and was broadcast on ITV4. 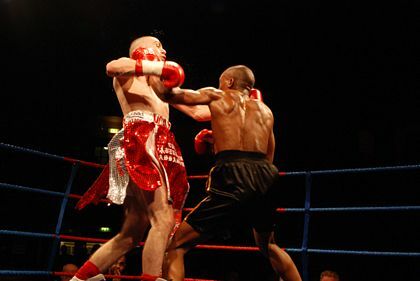 It went to the eighth round when the referee, John Keane, stopped it since Lee was winded with a blow to the left of his body and had difficulty getting back to his feet. John Murray retained his British title. 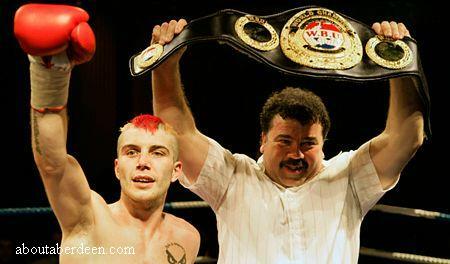 On 25 October 2008 he fought Arek Malek from Poland at the Beach Ballroom. He won the eight round bout with 80 to 71 points. This saw him more serious and very focused and for the first time did not dye his hair red. He has a fighting weight of 9 stone and 9 lb. They fought for 12 rounds and the judges awarded the win to Lee making him the new WBU light welter weight champion. The scoring was 116-112, 118-111 and 119-109. This saw McAllister become the first Scottish simultaneous two weight world champion. In March 2008 it was announced that he will fight Kpakpo Allotey from Ghana for the WBU light welterweight belt at the AECC on Saturday 29 March 2008. Satellite channel Setanta Sports at Setanta.com will broadcast the boxing live from the AECC on 29 March 08. He boxied Craig Docherty, a fellow Scot, on Saturday the 6 October for the vacant World Boxing Union (WBU) lightweight title. 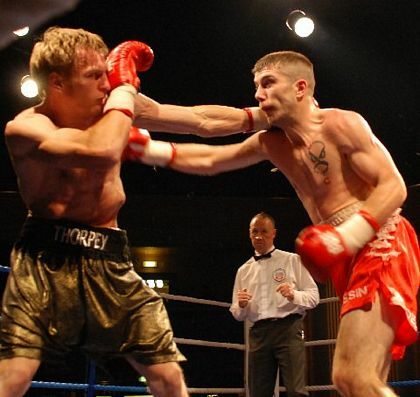 Craig Docherty had a record of 20 wins, 3 losses and one draw and was a former Commonwealth and British super featherweight. Despite sustaining a broken nose early on he won on the evening which was a day after his 25th birthday. He beat Craig Docherty in the ninth round when the towel was thrown in the ring by hos opponent's team. This gives him a straight run of 18 pro wins. He has vowed to become a three weight world champion by next winning the light welter and welter belts. He hopes to increase crowd capacity from 1200 to around 6000 at the AECC. On Saturday 26 June 2007 he won the International World Boxing Federation Champion Lightweight inter-Continental from Ben Odamattey of Ghana. He bravely fought him with an injured right hand from the second round and won 100 to 91. 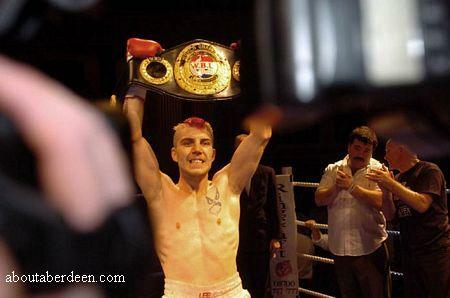 Wearing his trademark red shorts and sporting a shaven head with two red dyed sides he ended the night holding the WBF Lightweight and British Masters belts. He needed weeks of intensive physiotherapy to repair damaged muscles in his left shoulder. This put him into the world top 15 at WBF. He trains locally and in Sheffield at the Brendan Ingle Gym. Apex Tubulars sponsors him - look out for his VW Golf car with his name, nickname and the company logo embossed on the side. His manager was John Ingle. In 2008 he signed a three year deal with Tommy Gilmour. His height is 5 feet and 9 inches. He married fiancee Christine Neville in June 2006. Their first child, Liyah, was born in August 2008. Fights have been held at the beach ballroom. This includes the memorable one with Stuart Green which lead to him proving he is the Aberdeen Assassin by winning the Scottish Pro Championship with an eighth round knout out. This made him the first Aberdonian Scottish pro champion in 50 years. His weight for this was 9 stone 8lbs and 10oz. He entered the ring to the tune of 500 Miles by The Proclaimers and proved that he's ready to go another 500 Miles and aim for the British Title with a fight hoped for with Lee Meager so that he can claim and wear the coveted Lonsdale Belt. No doubt he'll go on to claim another - perhaps the Commonwealth, European or even the World titles. He is now ranked number five in the British boxers lightweight rankings. He is the youngest fighter in history to achieve this position. This puts him ahead of Kevin Bennett, the former Commonwealth champion and International Boxing Organisation world contender. Not bad for a loon who was so injured in 2003 whilst holidaying in Crete that doctors feared he may never walk again when he fractured his pelvis in a motorbike road accident. He has three brothers who are also boxers. They are David McAllister, Matty McAllister and Steven McAllister. Each brother is trained by their father David. He has also been the coach for Richard Muncie, James Ancliff and Darren Traynor.